Tendo specialises in providing strategy and business mentoring to companies, particularly SMEs who wish to grow. We recently built their new site to support them rolling out more products to add value to their clients. If you are not getting the results you desire, working long hours and not taking the financial rewards you would like from your business, then you need to speak to Tendo who will enable you to do more of what you want whilst catapulting your business growth. Tendo provide masterclasses for business owners who want to build on their existing success and turn ideas in practical delivery plans. 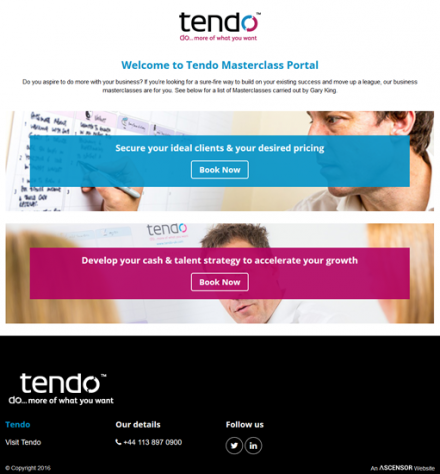 Our client needed a landing page to host the series of Masterclasses that Tendo offers. We created a total of three Air Websites sub-domain websites including a Masterclasses homepage with two sites to showcase each of the Masterclasses the company provides including Cash & Talent and Clients & Pricing. Visitors to the Tendo website can be navigated to these two sites from the Masterclass section of the Tendo website or be sent there from social media or e-shot activity. The same one-pager website design was chosen for both the sites which automatically scrolls users to the relevant header they click on at the top of the site (e.g. testimonials). You can register and book onto the Masterclass using the appropriate site which both include a prominent banner. "As always Ascensor provided a cost effective, visually stunning and easy to update and navigate solution, using their Air package. These sites went from idea to live within ten working days due to the professionalism of the team and the ease of the solution. I would have no hesitation in recommending Ascensor to any business wanting to raise their profile and drive more visitors online."